Priced: $100.00 - $279.95 Rated: - 5 stars out of 5 by 1 review. 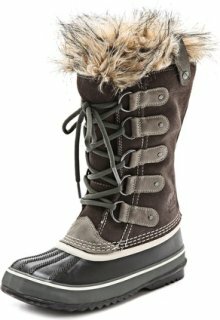 The Sorel Youth Joan of Arctic Boots offer the perfect blend of protection and style for young feet. Waterproof suede uppers are seam-sealed for extra protection. Boots are insulated with removable 9mm washable, recycled felt and faux-fur snow cuffs. Midsoles are constructed of reliable 2.5mm bonded-felt frost plug. Outsoles boast handcrafted waterproof, vulcanized-rubber shells with a herringbone pattern. Imported. Kids' whole sizes: 1-4 medium width. Quickly becoming a Sorel™ classic. For the woman who wants function with fashion. The Joan of Arctic boots are seam-sealed waterproof, featuring a waterproof full grain and suede upper, and a faux fur snow cuff. You don't have to leave your refined taste at home when the days get frigid and snow piles up outside your door -- just slip into the gorgeous Sorel Joan of Arctic Reserve winter pac boots. The removable InnerBoot has plush shearling lining, and the waterproof leather upper features swarovski crystal details. Sorel boots with a touch of rugged glamour. This pair is crafted with soft suede upper and topped with a faux fur cuff. The rubber shell keeps feet dry, and the removable felt lining keeps toes toasty. Rubber herringbone sole. It is not even snowing and my daughter will not take them off. She said she is so warm and cozy so I went and bought some Sorel's too. They are amazing, waterproof, cute, and insulated. PERFECT! Now that I know they are great boots for kids I am getting the Yoot Pac for my son! Bring on the weather!